I was on a day leave last Monday. So what did I do?? Well, I chilled out with my cuzins, Serene and Jules and sis, Rose. 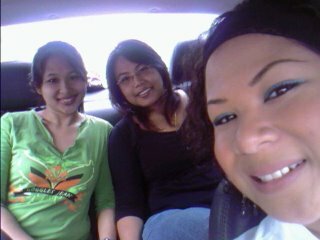 This is ma sis, Rose (on the foreground), Jules (in black) and I (in green) in Serene's car on the way to Parkway Parade. Here's another pic of me and my cuzins, Jules and Serene. Gerls, dun forget our plan for a picnic yah! !